Lets get back on the books subject I’ve mentioned to you a couple of weeks ago. 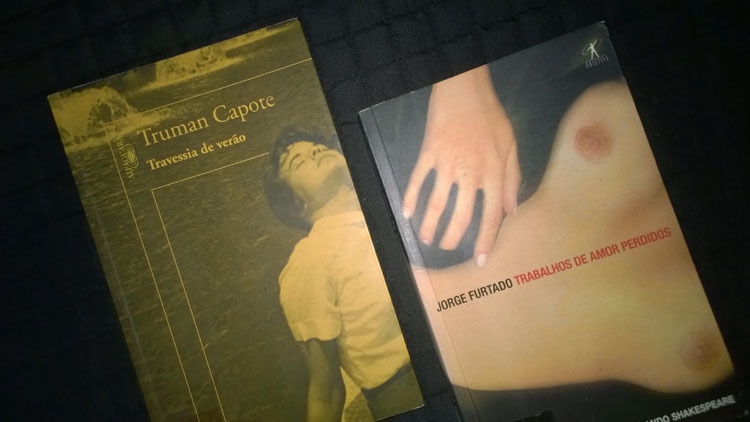 This time I have read 2 of the masters must know : Truman Capote and Jorge Furtado. SUMMER CROSSING ( Travessia de Verão ) by Truman Capote, for who doesn’t know is the same author of Breakfast at Tiffany’s, is a posthumously drama story of a rebel rich teenage who while her parents are on a Europe summer holidays marries hidden a poor social class guy , gets pregnant causing the death of club social scene on a car crash. Quite reflective thought. WORKS OF LOST LOVE ( Trabalhos de Amores Perdidos ) by Jorge Furtado, Brazilian writer of The Man Who Copied / Island of Flowers / The Normals, is a comedy of an introduction to Shakeaspeare exactly for the ones who never have read the mentioned writter also talking about a scholarship given and spent between Denmark / London / NY with a closure on the accidental date of 11th September 2001. Inspiring specially in what concerns the scholarship abroad, who knows try a master by this time somewhere.